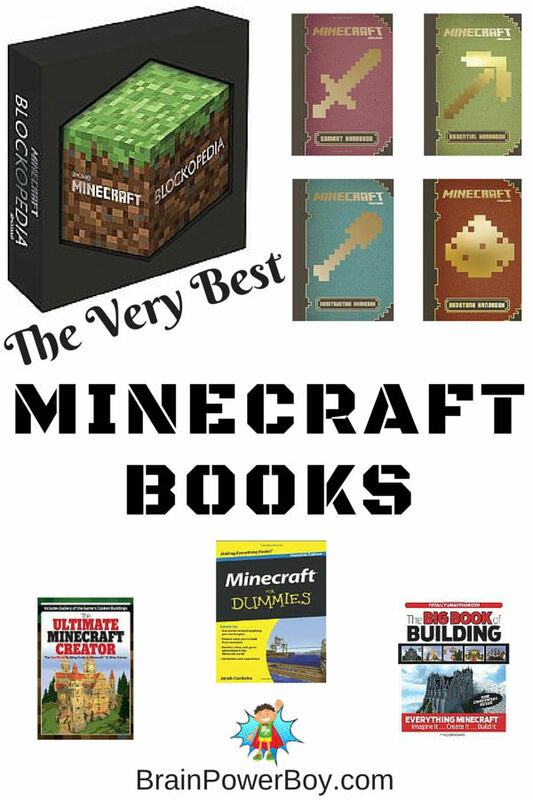 Best Books for Boys: Minecraft! To be honest I wasn’t sure if I should do a Minecraft book list. My son is very into Minecraft so I hear about it all the time. He owns some of these books and has read many, many more. Plus Minecraft just seems to get more and more popular each and every year. All in all that seems like a good enough reason for the book list. However, I kind of thought that the point of Minecraft was to figure it all out yourself. To start with what they give you and move forward to learn more. I have since decided that there is so much more to Minecraft and the books add to the learning in a way I love. So here is the Minecraft books list. As with our other Best Books for Boys lists, this is not a just list of all of the books on a topic but the very best books we could find. We work hard to narrow things down for you so you have excellent resources to go by. Before we get started on this list let me say that these books are for Minecrafters. If you don’t know about MC you should check it out before deciding if it is right for your family. Some of the books make references to mods, maps or other games that have guns, violence and/or blood in them. With most things there can be good and bad associated with them. Minecraft has been good for us and we watch to make sure it stays that way. I got Minecraft: The Complete Handbook Collection for my son for Christmas last year and he has really enjoyed it and uses it often. You can buy the books separately as well if your boy is only interested in one particular aspect of Minecraft. Essential Handbook , Combat Handbook , Redstone Handbook and Construction Handbook . These are the official Mojang books and they are all excellent. Highly Recommended! Build it is packed with info and color photos. Mobs, mining, mods and much more keep a boy who is interested in Minecraft happy. Great for kids who want to go beyond beginner into advanced, it features some neat things like advanced farming and advanced building techniques. Minecraft: Blockopedia is a beautiful, full-color, coffee table style book all about Minecraft. This is a hefty reference book done in encyclopedic style. It covers every block in detail and includes tips on what you can do with the blocks. If you want to take the survival aspect of the game into the real world and get your boys learning some life skills try our Survival Books List. My son owns Minecrafter 2.0 Advanced . There is a newer version out now Master Builder 3.0 Advanced but the books have some different things in them. They are both worth checking out. 3.0 includes secrets and strategies, and a very large list of mods, adventure maps, mini-games and servers to explore. The Ultimate Minecraft Creator calls itself a building guide but it is not that at all. What it is though is pretty interesting. This book is a full-color collection on many different Minecraft creations and more. I like it for how it shows just how much can be done with MC, it is absolutely amazing. I am really shocked at what people are making – so cool! Castles, forts, underground buildings and those that float in the sky–there is a wide variety of styles here. There are also redstone contraptions, servers to try and more. My favorite part was the pixel paintings! There are certainly more books but these are the ones that we feel are worth the money. They are tops in Minecraft books right now. We will keep an eye on things and either update this post with new titles or if there are enough new, high-quality books make a new list as time goes by. I hope you and your boys find some books to try. I am still amazed at how much learning can occur while playing Minecraft. Add in a few books and I am even happier. Special thanks to my son for helping with this post by helping me select them and providing his opinions on the books. If you are looking for the best books for boys on other topics boys would enjoy try Best LEGO Books, Books to Get Boys Coding or see our big book list. I’m so glad you pulled this list together. My friend has two Minecraft fans and since I prefer to buy books for their birthday gifts I was thinking about MC but didn’t know where to start! Off to look at these on Amazon. It seems everyone knows a few Minecraft fans! I’m glad the list is helpful to you. Awesome! My son just started playing Minecraft. I’m sure he’ll love these books! Hi Erin, Thanks for the comment. I think he will really like these titles. The 4 book set is a winner for sure. With a huge Mine-Craft fan in the house these are going to be a hit! I love that there are so many ways to show our boys how to enjoy a hobby like video games off screen. I think it helps enrich their game time when they get it. I agree Alli, adding to the enjoyment of a game off screen can be enjoyable for kids. The ‘Steve Surname Adventures’ series are very good. My 8 year old son loves Minecraft and his reading has greatly improved with reading this children’s book series. They’re written by a school teacher. Sue, We love Minecraft too and have a great list of Minecraft Books in case you are looking for more selections. Thanks for the recommendation. I had not heard of them.